The following quotation from a TIME magazine article is dealing with the alleged inability of Libyan officials to deal appropriately with the case of Gaddafi's son Saif al-Islam. This is considered as a sign of increasing chaos in Libya. Latest rumours on Libyan weapons from a former Gaddafi arsenal being transferred to Syrian conflict zones might support such estimation. ..... For months, prosecutors at the ICC in The Hague have fought a bitter battle to have Libyan officials transfer two high-profile defendants to the Hague, where they are wanted on war crimes: Gaddafi’s once hugely powerful son Saif al-Islam, and Gaddafi’s former intelligence chief Abdullah al-Senoussi. The ICC indicted both men (as well as the slain Gaddafi) back in May 2011, at the height of NATO’s bombing campaign, on charges that they ordered security forces to shoot unarmed protesters during the first two weeks of the uprising, before the opposition took up arms. ICC jurists argue that since the U.N. Security Council had ordered the ICC investigation in the first place, each U.N. member (Libya included) is duty-bound to abide by the arrest warrant, and ship the two to The Hague for trial. Yet despite that, neither man seems like to appear in the Dutch city any time soon, and if Libya’s new government has its way, they never will. ..... "
By the way, former Libyan dictator Muammar al-Gaddafi seems to become some kind of standard for political wickedness. The following evaluation was published the day before on June 28 by The Original Constitution الدستور الأصلي which belongs to the opposition against Egypt's president Mohammad Morsi. It describes the Egyptian president as "القذافي في نسخته المصري" "The Egyptian Copy of Gaddafi". Visitor to "blueprint news" coming from the Ugandan capital of Kampala. He could be located in the neighbourhood of "Gadaffi Mosque", named in honour of former Libyan dictator Muammar al-Gaddafi. 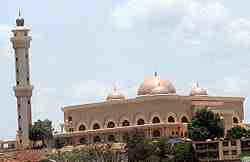 The "Moammar Gadaffi Mosque" is dominating the old part of Kampala city, capital of Uganda. Colonel Muammar Gaddafi of Libya built the mosque as a gift to Uganda, and for the benefit of the Muslim population. The completed mosque was opened officially in June 2007 and houses the head offices of Uganda Muslim Supreme Council that represents some 12% of Uganda's total population. "... To get to the mosque, you can drive down Gaddafi Road. Throughout the Ugandan capital, there are army barracks and auto repair shops named after the former dictator. ..."
Despite problems at home and abroad, U.S. President Obama once again proved his ability to attract a numerous German "fan club" when he came to Berlin on June 18/19, 2013. No drone attacks guided from Germany. "I regret these Germans are not American voters". "Whenever you are depressed, then travel to Germany". Tomorrow at 2:00 pm GMT (3:00 pm local time) U.S. President Obama will make a keynote speech during his visit to Berlin almost 50 years after John F. Kennedy declared: 'Ich bin ein Berliner.' He is expected to speak in front of Brandenburg Gate which has been the background of many dramatic events in German history. Barack Obama follows in footsteps of JFK with speech in Berlin. criminal pollution of the environment. ... 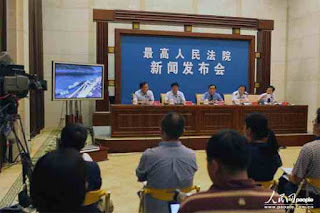 In view of the current state of environment and a most serious situation of pollution, what might be called unusually grim in some regions, an interpretation by the administration of justice is emphasizing to consider [the application of] a severe blow. Firstly, a reduction of the threshold for penalty measurement [in case] of conviction of crime concerning pollution of the environment. For example, in the past, a pollution of the environment causing the death of more than one person [led to charges in case of conviction]. Today, [same thing] can happen, if more than one person is seriously wounded. When, in the past, more than three persons died, this [had the quality] of increasing the punishment, while, today, only the death of more than one person is needed for a possible increase of punishment. Secondly, when a [sentenced] criminal turns into a [habitual] criminal, each pollution of the environment was considered as a standard case in the past. Today, while many standards are being fixed, it only needs a relevant conduct to [serve as] conviction. Now tried by a criminal court in Munich, Germany: A female gang member charged for support of a serial murder that victimized innocent small-scale businessmen with a migration background while state authorities didn't notice the common background of these politically motivated murders for a long time. The nationalist "Nazi" gang's two assassins, however, cannot be tried at the same time. They shot themselves when German security forces had tracked them down. The extent of that serial murder, comprising the assassination of at least nine victims, eight Turqish and one Greek immigrant, between 2000 and 2006, as well as incredible shortcomings in the proceedings of German police and state security, have caused a broad public interest in Germany. as her father is a Romanian. 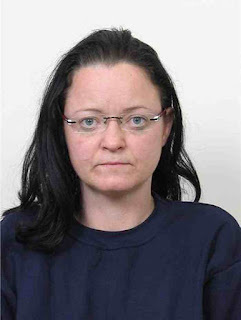 Female Nazi member Beate Zschäpe was not rooted in society. However, she was not isolated but embedded in an anti-social neighbourhood which became her "family". These people are mostly unemployed without any professional skills and depend on social welfare. Towards "foreigners" they express some kind of unreasonable hatred as well as they detest learned people among their compatriots and all kinds of state officials. Aggressive and arrogant Nazi girls are usually spoilt by their fathers. Obama and Xi JinPing - Another Historic Meeting ? Discussions not finished at daytime continued at supper. Important UPDATE added on June 9 / 10 ! In the frame of General Secretary Xi JinPing's visit to the United States and his talks with U.S. President Obama, there are some aspects the editor of "blueprint news" considers worth mentioning. Addendum to "The Trip that Changed the World"
The first aspect is regarding how official Chinese media are evaluating that meeting. Today, June 8, semi-official People's Daily published a comment in Chinese that had been originally written in English by Christopher Nixon Cox, a New York lawyer and grandson of former U.S. president Richard Nixon. 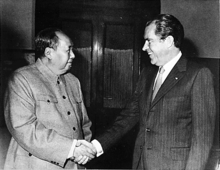 As Nixon was the first leader of his country to visit China's famous Chairman Mao ZeDong in February 1972, his grandson is now reminding that historic meeting which can be regarded as the beginning of a process leading to an opening of the People's Republic towards the West. That process finally turned China into a successful global player regarding, both, its political and economic influence. Another aspect is regarding the perception of China as it appears in the view of U.S. citizens. It seems the American public meanwhile sees China as much as an ally or, at least, a "frenemy". Even though there are political obstacles enough on the path of a future U.S. - Chinese cooperation, some common understanding of regional peace as a prerequisite for reaching both sides' similar economic goals might become the glue of such cooperation. Recent news on China reacting upon North Korean provocation (=> related blogspots) might be a first sign of political change as well as China's new adage of "Realizing the Chinese Dream" which should mean nothing else but an increase of personal wealth and domestic consumption in Mainland China, going together with an amelioration of working and living conditions for China's citizens. The latest Gallup poll, at least, shows 55% of Americans asked think China is either an ally (11%) or a nation friendly to the United States (44%), while 40% say it is either unfriendly (26%) or an enemy (14%). Yesterday, June 8, U.S. National Security Advisor Tom Donilon informed reporters after the conclusion of the two-day summit on Friday and Saturday. He said "The discussions were positive and constructive, wide-ranging and quite successful in achieving the goals that we set forth for this meeting". Cyber security and cyber issues, a "center of the relationship" between the world's largest economies, were one of the important topics when the two leaders had discussions on economic issues. According to Donilon, the President made clear "the threat posed to our economic and national security by cyber-enabled economic espionage". "The President underscored that resolving this issue is really key to the future of US-China economic relations. 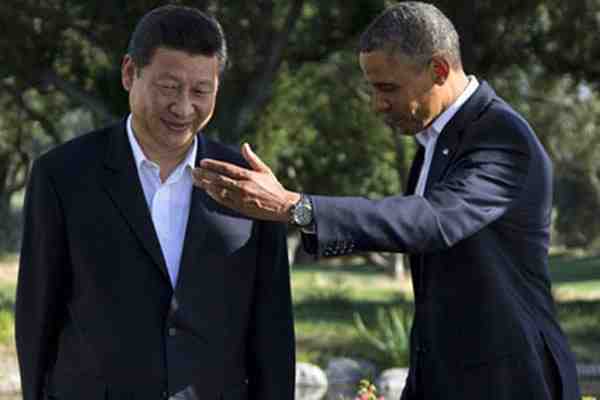 He asked President Xi to continue to look seriously at the problem that we've raised here," he said. .......... Among other things, Donilon said the two leaders agreed that "North Korea has to denuclearise, that neither country will accept North Korea as a nuclear-armed state and that we would work together to deepen cooperation and dialogue to achieve denuclearization." The two sides stressed the importance of continuing to apply pressure both to halt North Korea's ability to proliferate and to make clear that its continued pursuit of nuclear weapons is incompatible with its economic development goals, he said. Cyber Attacks - According to the White House, the Chinese acknowledged the problem, agreed to investigate and work out "rules of the road". "I believe we can work together on this rather than at cross-purposes," Obama said. Climate change - For the first time, China agreed to work with the United States to limit the production of greenhouse-gases. "Art of War" on a Latin American bestseller [bookshelf]. Xi Jin Ping said he found the Portuguese edition of Sun Zi's "Art of War" in an automat selling books while riding on a Sao Paulo railway during his visit to Brazil. Change of Chinese - North Korean Relations ? China demanding, the North must abandon the nuclear [issue]. China doesn't put forward the "relationship of sworn brothers". North Korea to "abandon the nuclear issue". three laboratories for the [fabrication] of a chemical weapon. The information consultant at the [Iraqi] ministry of defense, General Mohammad al-Askari, said in a press conference that " this clique consisting of five persons, not identified [by] the defense ministry's intelligence, was able to carry out [each step of] their operation from the very first moment. " ... chemical attacks directed against targets inside Iraq and in Europe and North America. This should happen side by side with other means [used by] intelligence [communities]. ... particularly Sarin gas, nerve gas and mustard gas. And he added that [this] cell [received] " programs and their [coordination] from Al-Qaeda organizations outside of the country. " Today, Saturday [i.e. June 1st], the Iraqi government said they captured a cell [of activists] suspected of being a subdivision of Al-Qaeda organization [and that is] planning the production of toxic chemical compounds like mustard gas for [launching] attacks on Iraqi forces and their distribution to [foreign countries] to launch attacks in Europe and the United States.